I was nine years old and so excited for Santa Claus to visit our house in Fayetteville, North Carolina on Christmas Eve, but I was one of those kids who loved to sleep (still do), and I always figured Santa would come sooner if I fell asleep quickly. I never waited up for Santa. But on this particular Christmas, my little brother crawled in bed with me very early, about five o’clock in the morning, and I woke up. I was so excited that I could not go back to sleep! My parents had a firm rule about Christmas morning, that we could not wake them up until six a.m. So there we were, both awake and antsy, wanting to go down the hall, but we knew we had to wait, or we would be in trouble…and Santa might not have visited yet, so if we were bad on Christmas morning, we might not get any gifts. It was so exciting but so scary, too. 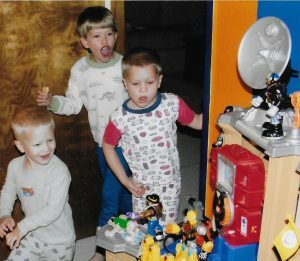 As the older sibling, I thought it was my job to keep my brother Scott, who just turned seven that week, entertained until we could wake up Mom and Dad. I checked the clock. Five-thirty. I looked around, and my Bible was sitting on my bedside table. I opened it up to Luke and easily found the story of the first Christmas in Luke 2:1-20. I read it to Scott in a whisper, and then we talked quietly about it, imagining what it must have been like for the little family of Joseph and Mary, traveling far away from their home, and then finding themselves in such an emergency. As military kids, we really felt for them, having experienced living away from our extended family for many years. I was in fourth grade, and this was my fourth school since kindergarten. We looked back at the words in the Bible, specifically at verses 11-12: “Today in the town of David a Savior has been born to you; he is the Messiah, the Lord. This will be a sign to you: You will find a baby wrapped in cloths and lying in a manger.” We thought about the Christmas songs we knew, and sang (very quietly) the song “Away in a Manger”. It suddenly seemed to mean a lot more than it ever had before. We moved the curtain and looked out the window to see the stars in the cold, clear air. They were pretty, shining down on us, but none of them shone much brighter than any of the others. I pointed out to Scott that they all looked the same, and we wondered what it would have been like to have seen the star that led the Wise Men to the baby Jesus. We stopped at that point, got down on our knees next to my bed, and I prayed to Jesus. I thanked Him for coming to earth, for being born a little, helpless baby, and for giving up all the glory of Heaven to be one of us. I asked him to watch over my family and watch over my brother, and to help us all to be good. Amen. And then I checked my clock. One minute to go! Scott and I got up, brushed ourselves off and carefully, quietly opened the door and then rushed towards my parents’ bedroom…it was time for Christmas! My poor parents. I now know as a mother what a long night Christmas Eve is, and how much work goes into the “magic” of Christmas. I appreciate that now, but ever since that Christmas morning, I have appreciated the real love and the real power of Christmas. And it has nothing to do with the presents. God bless us all in this special season, when we celebrate the birth of his son, Jesus. Christmas as an Army brat sometimes can be bittersweet. Our years in Germany were, especially. I mean, Christmas in Germany is awesome! The Germans practically invented Christmas…the lights on trees came from the Tannenbaum, the Christkindlmarkts are amazing and fun, gingerbread tastes fresh, and the weather is almost always cold and crisp, perfect for the feeling of the season. However, Christmas is a time for family, and it always hit home that in Germany, our family was just us four. My dad is one of seven kids in an incredibly close family, and my mom is one of four in an equally close-knit group. Christmas in Louisiana was always a wild affair, with passels of kids roaming loose as the adults visited, hugged each other, and slapped dominoes on tables. I had twenty-seven first cousins in Louisiana, but only six in Kentucky, so Kentucky was more of an adults’ holiday, with proper sit-down manners on display…so I thought Louisiana was way more fun as a kid! We were in Germany because of my dad’s job in the United States Army, and we were very proud of him and his service. 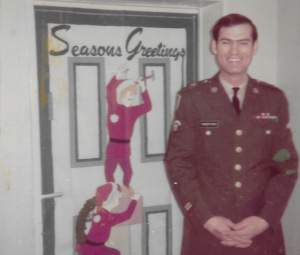 He had been to Vietnam, gotten out of the Army and then returned to become a career soldier. We knew this was our way to serve the country, too–to be his support. So when he got orders, so did we. I had been very unhappy to move to Germany in January 1987 as I felt I’d just become rooted in Fayetteville, North Carolina, but by the time our first Christmas in Germany rolled around, I was happy we had come. I had met friends, had a school I enjoyed, and loved the experience of learning the language in a country where I could practice. I still missed the feeling of extended family, especially around the holidays. Shopping in November to ship gifts back home in time for Christmas definitely wasn’t as fun as seeing loved ones open your specially chosen gifts on Christmas morning. Now, I tear up when I see the commercials at Christmas of servicemen and women in various duty stations around the world, wishing their family and friends a very merry Christmas season, as they serve our country and us. They give up that feeling of family; many of them even give up having their own spouses or kids with them in places where it’s not safe, and they stand on a wall and protect us. God bless those men and women. Thanks to them, we have freedom to enjoy our holidays. On Saturday, Dec 23rd, my family and I had the opportunity to go to the Armed Forces Bowl in Fort Worth, where Army played San Diego State in football. I enjoyed the game…but there were tears and gestures of appreciation, as soldiers were recognized for their actions and for who they are. There’s a reason they are called servicemen and servicewomen–it’s because they sign up to give that service to all of us. Thank an active duty soldier if possible, or a veteran if you’re lucky enough to know any, and remember their sacrifice throughout the year, when you have all your family surrounding you. I adore Christmas Eve, much more so than waking Christmas morning. It thrills me to take my family to church that evening, so we can celebrate Jesus’ birth like the shepherds that first Christmas, with hymns of praise and candles in the darkness. When we bring our boys home from church that night, they get sleepy in the car, and toddle off to bed almost immediately. They all go to one boy’s room, usually Brady’s (who’s the oldest), as they have for over a decade. They always insist on their “sleepover” for Christmas Eve, so they can rise and see Christmas morning all together. This is one tradition I’ve loved since it started when they were six, four, and two. The youngest joined a couple of years later. Kyle and I then kick into high gear, locking our door and wrapping presents like maniacs. Until last year, when our youngest found out about Santa, I always made sure that tags were printed in different fonts so no handwriting could be recognized as ours. Kyle, who’s our home creative director, composed a rhyming letter from Santa that always pointed out that the greatest gift is brotherhood. We finally fall into bed for a couple of hours of exhausted sleep, until boys jump on our bed about the time the sun peeks up. It’s satisfying, as a night full of love and giving. Honestly, the present opening is anti-climactic for me. But the expressions on their faces are precious, and I wouldn’t give that up for the world. Wonder still exists, and it is in children at Christmas. Enjoy the children in your life, and also those who are children at heart. I hope you spent a wonderful Christmas Eve and Christmas Day with your loved ones, and enjoyed the true meaning of the season. It was Christmas Eve 2012, and I was crying my heart out. I felt like a complete failure at Christmas, at motherhood, and at life. After over a decade of staying at home with my four boys, that fall, I’d gone to work full-time, having secured a teaching position at a local junior high teaching 8th grade U.S. History. I loved what I taught, lucky enough to teach about the American Revolution, writing of the Constitution, and development of the Republic up until the Civil War. It was so satisfying during the day. However, afternoons and evenings were a whole different matter. I felt like I was playing catch-up all the time, rushing home after school to feed kids, sometimes having dinner at 4:30 in the afternoon so we could make it to football practice by 6:00, then off to other events as needed. My crockpot became my best friend, but I wasn’t always disciplined about planning meals and trips to the grocery store in advance. So I was scrambling. My husband helped a ton, but he was working in finance and often didn’t get home until close to 6, then he changed clothes quickly and headed out to football practice as well—he was a coach. Sometimes he could take our son, but oftentimes he had to pick up other kids to bring them to practice, so the travel still fell on me. This mad dash continued all through the fall, but football season ended the first week of December, so I thought things would slow down. Only…Christmas. I had always shopped months in advance, making sure I picked up things for the boys throughout the year, on sale to be frugal, and this year I had not had the time to think about it. So here it was, December, and I had not even started. I started freaking out, afraid that I wouldn’t get it together. And I didn’t. We shopped, we bought, but with school and everything else going on, and life getting in the way, I didn’t keep close track of what we were doing for the boys’ Christmas. 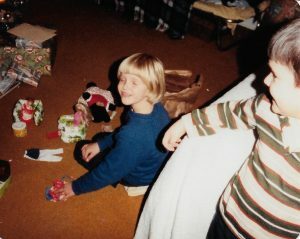 We got to Christmas Eve, and were wrapping presents late that afternoon. We always tried to keep the number of gifts for each boy roughly the same, since they were still young and noticed “unfairness” whenever they felt shorted. Looking at the pile of gifts, my husband noticed that one son had considerably fewer presents than the others. In fact, he only had two presents. The other boys had between eight and ten. And of course, it was the son who noticed everything who had fewer gifts. It couldn’t be McCrae, who was eight and so easy-going…it had to be Caden, who was twelve and had famously exclaimed in front of all the family the previous year, “I never get nothing,” when he felt his younger brother Jaxon got more presents at the grandparents’ house! How could I have missed this? How could I have let this happen? Kyle jumped in the car and headed out to see what stores were still open, and what he could manage to find. I sat down on the bed and cried. Kyle returned a couple of hours later, and he’d found enough items to round out the gift total. Some of them were genuine gifts, that our son Caden would love. Several, however, were things from last-minute stores like Walgreens, that we wrapped just to give him enough. As-Seen-on-TV items went into the pile, along with wrapped candy…anything to make it even. I was so torn up. I had failed at my greatest job, making joy for my children. I went to sleep that night defeated and hurt, and afraid what the next day would bring. But Christmas morning defied all my expectations. Each child loved his gifts, even Caden! The thing he was the most excited about was the giant candy-cane…he carried it around all day. There was joy, and laughter, and everyone felt loved. My devotion for the day, read after we opened gifts, was Luke 10:38-42. I realized then that I’d been channeling Martha, the sister in the New Testament who tries to make everything perfect. I had put expectations on myself that weren’t rational. Perfection wasn’t a good goal. Instead, I needed to put a little more Mary in my life. Sitting at the foot of the Master and learning was more important than how good my house looked or how perfect my Christmas was. Who, after all, was I trying to impress? So I took a deep breath, and returned to my crazy life. Ever since then, when I start to feel overwhelmed and as if things are spinning out of my control, I remember that they have never been in MY control, but in His, and I let go. My faith and that quality have gotten me through some tough times, without which I would never have made it to the other side. © 2018 Copyright and Paid Political Ad by Trasa Robertson Cobern Campaign.